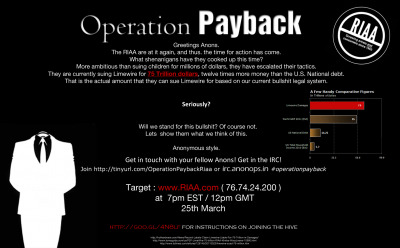 RIAA Targeted by Anonymous Operation Payback ! The rogue hacktivist movement Anonymous is apparently breaking out the Low Orbit Ion Cannon again for a reprise of the Operation Payback campaign, this time setting their distributed denial of service (DDoS) attack sites on the Recording Industry Association of America (RIAA). The campaign to disrupt the RIAA website is reminiscent of Anonymous' earlier missions to protest actions taken by anti-piracy interests seeking to enforce copyright infringement sanctions. The RIAA is seeking trillions of dollars in damages from the P2P file-sharing network LimeWire for facilitating copyright infractions. Federal Judge Kimba Wood has already indicated she believes that the logic behind the RIAA calculations of the damages sought in the case is flawed, according to Computerworld. "If Plaintiffs were able to pursue a statutory damage theory based on the number of direct infringers per work, Defendants' damages could reach into the trillions," Judge Wood wrote. [#OperationPayback] THE POLL IS CLOSED. THE CURRENT TARGET IS RIAA. SET TO KICK OFF AT 16:00 PACIFIC TIME. PLEASE JOIN #RECRUIT TO HELP GET THIS RAID OFF THE GROUND. Most recently, Anonymous is known for having breached the systems of HBGary Federal - a security company who was involved in efforts to reveal the identities of the Anonymous leadership - and for defacing the website of the controversial Westboro Baptist Church. Anonymous had previously targeted the websites of PayPal, Visa, MasterCard, PostFinance Bank, Amazon, Bank of America and others who had halted business relations with WikiLeaks, as well as also launching attacks against the websites of Senator Joe Lieberman and Sarah Palin for speaking out against the WikiLeaks data dumps. Anonymous employs a downloadable tool called the Low Orbit Ion Cannon that is made available to those who want to participate in a DDoS attack. The success of an attack largely depends on the operation organizer's ability to publicize and gain crowd-sourced participation for the attack "hive". Operations that fail to attract enough participants fail to take the targeted website off-line.